This is only available from Letchworth’s at Grand Chapter and is blue with red Taus. It comes in a variety of qualities and is acceptable in any Chapter and when visiting Supreme Grand Chapter. It is also, by command of the Pro First Grand Principal, permissible to wear this in Craft Lodges. 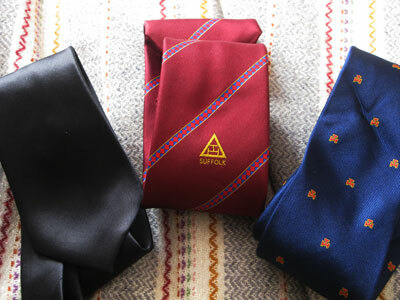 Note that this tie can only be worn in a Suffolk Chapter or at a meeting of the Province of Suffolk. Generally, you cannot wear this outside Suffolk without approval of the Grand Superintendent, any more than ties of other Provinces can be worn within Suffolk. It is not permitted to wear Provincial Ties in Supreme Grand Chapter.